Puri(Samaya Bureau): The Trinity, Lord Jagannath, Lord Balabhadra and their sister Goddess Subhadra are fresh after recuperation from fever after a gap of 15days. The fever is gone after the special treatment by Daitapatis who belong to the Sabar community. The holy Trinity as per the tradition emerge from the Anasara Ghara, where they were in hibernation for treatment, for the grand ‘Nabajoubana Darshan’ in the sanctum sanctorum of the temple. All the rituals of the Trinity have resumed in the temple after a gap of 15 days when the lords were out for treatment of fever which the two brothers, Lord Jgannath and Lord Balabhadra and Devi Subhadra, their sister catch due only to the ‘Grand Bath’ on the occasion of Snana Purnima. Another category of servitors, Dasmohapatras, were busy till late into the night on Friday to adorn the Trinity and completed the ‘Banakalagi’ ritual which is conducted for the special ‘Nabajoubana Darshan. Simultaneouly, at Ratha Khala, the chariot making has reached the final stages. After the completion of ‘Agyan Mala’ ritual or the divine permission all the three chariots would be moved from Ratha Khala to Singha Dwara where they would be ready to be pulled by lakhs of devotees tomorrow on Gundicha Yatra, the first day of Rath Yatra. 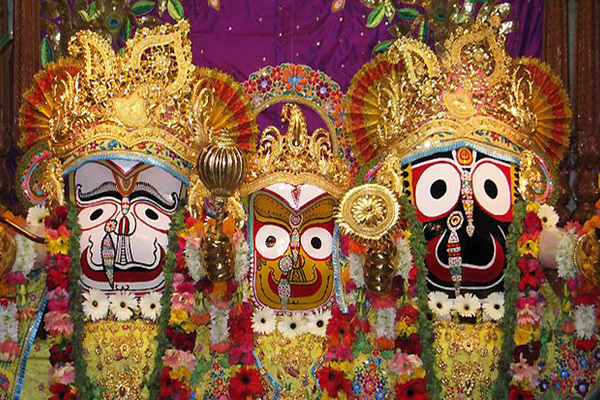 Lord Jagannath and his elder brother and sister would embark on a nine-day sojourn to Mausi Maa temple.